January has come and gone, the Steelers just barely beat out the Card’s in the Superbowl and Punxsutawney Phil gets to take another 6 weeks of PTO. As exciting as all that has been, we’ve got some breaking news of our own that hasn’t hit the papers yet. Helix Power Tower Plus Throttle Body Spacer – The Helix Power Tower Plus gives incoming air the perfect swirly, purported to offer up to an extra 22 HP if you gun it or an extra 4 MPG if you feather it. This bolt-on spacer is pretty easy to install, taking about 45 minutes for most vehicles. AirMax Spiral Flow Air Intake – Here again, Street & Performance puts to work the idea that spinning air swirls some extra horsepower out of the engine. This time, it’s a rifled sleeve inside the intake tube that starts the spin and gets all that extra air in line to burn. Good for extra power, torque and maybe even an MPG or two, this spiral flow intake comes with a high flow washable air filter and a steel heat shield for maximum engine gains. The whole kit comes powder coated for a flawless finish. AFE – Get a $25 cash card (via AFE mail-in-rebate) on AFE’s Stage 2 intake, the Blade Runner intake manifold, the Mach Force XP & Large Bore HD exhaust systems. The purchase must be made between 2/1/09 and 4/30/09, click the banner for complete details. AFE Stage 2 Air Intake – More than just an air filter and plenum, the stage 2 kit replaces your entire air intake tract, improving flow dynamics by providing a more laminar air flow straight into the manifold. AFE Blade Runner – Perfectly complement your air intake with the Blade Runner intake manifold. Larger than stock and constructed from high quality materials, AFE’s Blade Runner intake manifold will flow more air into your engine, letting it breathe easier and make more power. The AFE Large Bore HD Exhaust is a great way to beef up your exhaust tone. The Large Bore HD uses oversized aluminized tubing to free up extra horsepower and give your engine a nice low end grunt. Available in both cat back and turboback styles. AFE Mach Force XP Exhaust – For maximum power gains, look no further than the Mach Force XP from AFE. Up to 5″ stainless steel piping is used on this monster exhaust, thereby minimizing back pressure and allowing your turbo to spool faster and make more boost. Turboback or catback, it’s your choice, but no matter what you choose, you won’t be disappointed by the power gains. We’ve also worked out a few truck tonneau cover and exhaust promos. All of these promotions are valid through 2/28/09. Here’s the quick and dirty break down, click the links if you want to get all the details. Truxedo Tonneau – Free Tailgate seal with the purchase of any Truxedo Tonneau. 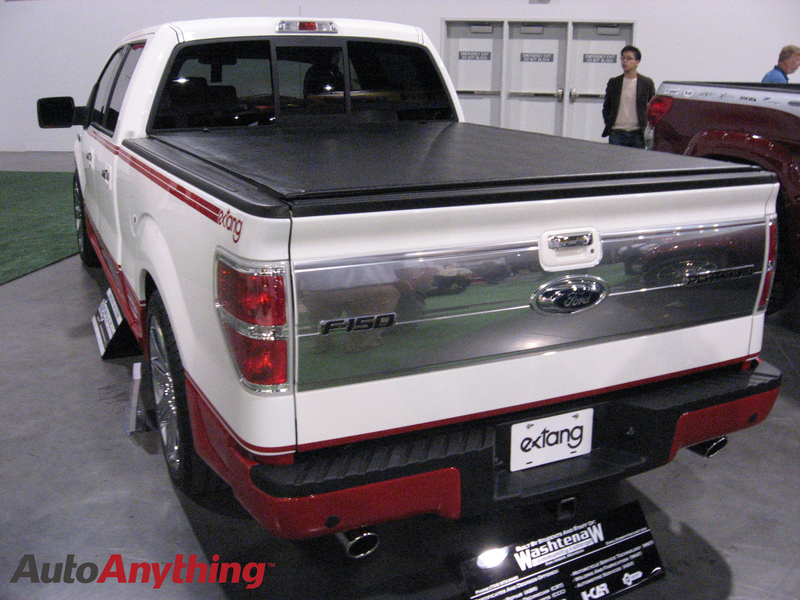 Extang Tonneau – Free MaxSeal tailgate seal with the purchase of a Trifecta, BlackMax, Tuff Tonneau III , RT Tonneau or Revolution tonneau cover. Undercover Tonneau – Free MaxSeal Tailgate Seal with all Undercover tonneau cover orders. Lund Tonneau – Purchase any Lund Genesis tonneau cover and get a free MaxSeal Tailgate seal. MBRP Exhaust – Free MBRP Exhaust Tip with the purhase of an MBRP 4″ Diesel Exhaust System. Borla Exhaust – Free Borla Hat with the purchase of any Borla exhaust system or header kit. That’s what I’ve got for you this week, but keep an eye on the blog to stay in the loop, we’ll have even more for you next week. We’ve taken an additional 10% off the Edge Evolution, Edge Mileage and Edge Juice programmers. Not only that, but we’ll overnight ship your order for FREE and throw in a Edge sweatshirt at no additional cost. This promotion just started today and ends 3/5/09, so if you’ve been wanting an Edge power programmer, don’t miss out on this deal because it’s the best you’ll find, on or off the net.